Teddy Tchoudja had a busy weekend at the Emirates Arena, Saturday saw Teddy pick up the National Indoor Shot Putt’s title when she threw 13.56m. She returned to the Indoor Stadium on Sunday for the Scottish Indoor Athletic League and showed everyone she is in great form when she threw 14.05m to claim the Scottish National Indoor Record for her age group. Well done to Teddy and her coach , John Scott. Saturday also saw a number of other athletes competing at the National Indoor and a number picked up medals. In the 1500m Daniel Bradford picked up the silver medal when he ran 3.56.07, David Martin was 3rd in the Long Jump (7.23m) with Angus McInroy also 3rd in the Shot Putt (13.46m). The 200m saw Paul Easdale running 24.67. The 3rd and final match of the Scottish Indoor Athletic League on Sunday saw our younger athletes getting an opportunity to compete at the venue for the European Indoor Championships in a few weeks time. 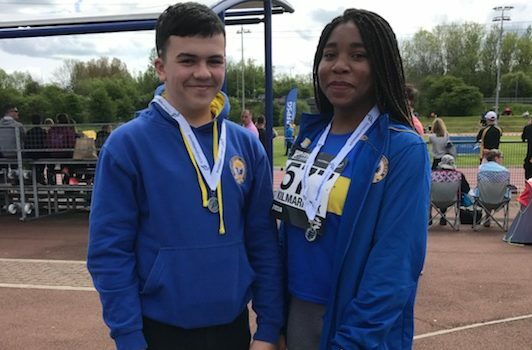 As well as the excellent National record by Teddy we saw 32 personal bests from our young athletes with the results we have to date: Imogen Millar (60m, 600m), Hannah McNicol (60m, 600m), Ruaridh Collins (60m, St Long Jump), Daniel McFall (60m, 600m), Oliver Elder (60m, St Long Jump), Erin Orr (60m), Jonathan Hooper (60m, 60m Hurdles, Shot Putt), Sophie Gardner (60m), Ruaridh Campbell (60m), Emma Leiper (200m), Katie Woods (200m), Callum Thomson (200m), Adam Clifford (200m), Maynard Conteh (200m, 400m), Olivia Millar (300m), Mark Clifford (600m), Amelia Roberts (800m), Jessica Grant (800m), Michael Conteh (60m Hurdles, Long Jump), Ben McLuskey (60m Hurdles), Violet Campbell (High Jump), Jay Millar (Long Jump), Chloe Fox (Long Jump), Teddy Tchoudja (Shot), Ruaridh Prentice (Shot), Beatrice Wainwright (Shot), Sophie Fuge (Shot).